The 4QD series controllers are designed for Permanent Magnet motors. This application note is based on theory and feedback from customers who have used series wound motors. As such it is an application which 4QD cannot support or offer additional advice on. To control speed and direction of a Permanent Magnet motor you need to control the armature only, by using two wires and by reversing the polarity of current flow between these two wires to change motor direction. Although this will control the speed of a series wound motor, you cannot reverse it by simply using two wires. You must reverse the direction of the armature current without reversing the field current. There are two ways of connecting a series-would motor to the 4QD controllers to do this. 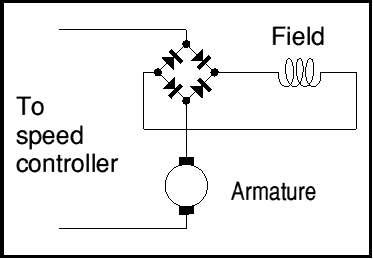 A bridge rectifier (of suitable rating) is used to ensure field current always flows in the same direction and only the armature current reverses. Whilst this method is the simplest, note that the full motor current flows through the rectifier. For the high currents that the 4QD series can handle this does mean using a substantial power rectifier with appropriate cooling. Some time ago a user of our connected his series wound motor as below and found that it worked fine. However – be warned that this is not a connection we have tried and it is given here without any guarantees. Furthermore. as it’s not our idea and is untested, we regret we are unlikely to be able to answer any questions it may raise. To properly reverse a series wound motor, the field wire should be connected in series with the battery positive lead and the armature connected as normally used with a PM motor. We have illustrated it with the 300amp version, but the method is the same with the smaller controllers. There is one caution, in using the controller thus is that the field inductance can cause the main decoupling capacitors to work a lot harder. Depending on motor type and load these can overheat and, in the extreme situation, vent. To reduce this problem, a diode (shown on the diagram) must be fitted : this is across the field winding and it allows field current to circulated independently of the armature current. This diode is quite difficult to specify accurately. At full load it is doing nothing, and also at no load it is doing nothing.! These are Shottky diodes which are low dissipation types, even so they may get hot and will need some heatsinking. The currents quoted are continuous current ratings, transient currents handling abilities are enormous (26 thousand amps). A high voltage device is not required : the field is unlikely ever to have more voltage across it than half the battery voltage, but of course this is dependant on the relative resistance of field to armature.